One of the most powerful and handy apps for enterprise users of Windows Phone, Office Lens, has been updated with the ability to send your photos of documents and whiteboards directly to PDF. The update, version 1.4.3727.0 for those keeping score at home, allows those PDFs to have selectable text and can be saved directly to your OneDrive account for safe keeping. If you aren’t familiar with it, Office Lens for Windows Phone allows you to snap a photo of a flip chart, wallboard or piece of paper from virtually any angle and it will straighten it and to give you a front looking view. It’s one of those PFM (Pure Frickin’ Magic) apps because when you see it in action for the first time, you’ll be blow away. them to OneNote to integrate them into your notes for that meeting or event. Microsoft has been updating Office Lens regularly over the past few months. This is the 3rd update since November with each update bringing performance improvements as well as new features. If you have not tried out this app, it is a gem for anyone who takes a lot of notes in meetings and needs to capture flipcharts or wallboard mark ups during them. It is one of my essential apps for business users. 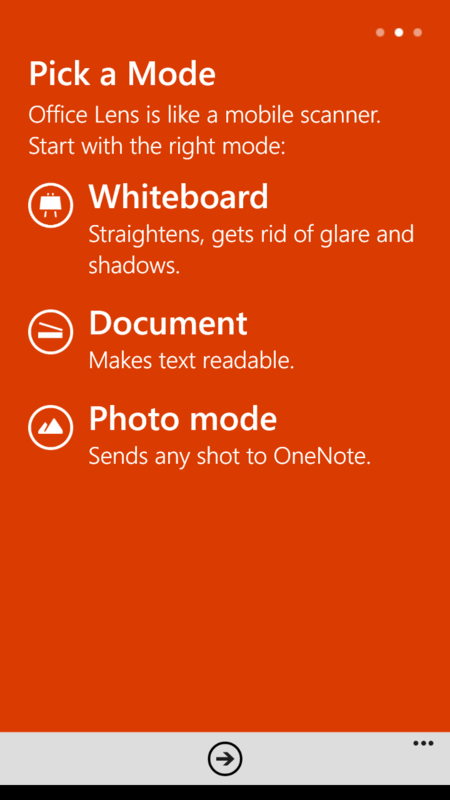 Office Lens is free and available now in the Windows Phone Store.